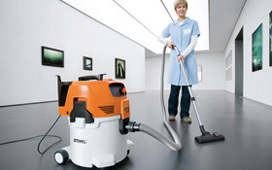 With STIHL wet & dry vacuum cleaners floors can be roperly cleaned – right down into the tightest corners. No matter whether dry or wet – with their massive suction, these machines swallow everything that gets in front of the nozzle. Thanks to many practical features such as washable filters and the vacuum hose adapter for the direct vacuuming of dust when sanding, sawing or planing, the wet & dry vacuum cleaners are useful helpers both during and after work.